There is something about the New Year that makes us want to improve. It is a time when many of us rededicate ourselves to goals that have slipped in priority or have just been on the back burner. A person’s attention to their finance can have an enormous positive effect over the course of their life. This is the time of the year to review your financial goals. These goals or resolutions can help you achieve spectacular results with just a little attention. 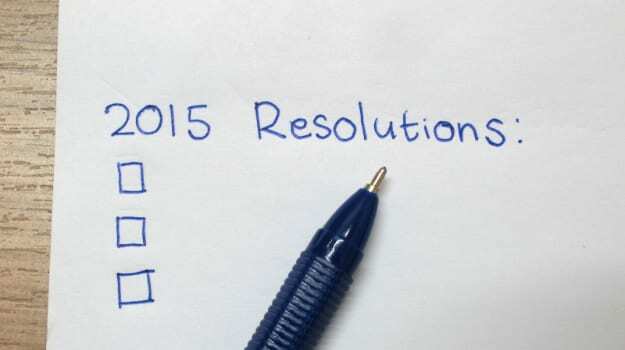 Here are my suggestions for boosting your credit in 2015. I am a huge believer in writing my goals down and keeping them in plain sight. I have no less than 5 large white boards with dry markers laying around my house. I have also been known to use the dry marker to write goal on my bathroom mirror. Sounds ridiculous doesn’t it? Not to everyone. Many entrepreneurs, psychologists, and other highly driven people believe that holding your goals present in your mind helps “attract” the goal. I am not sure I would go that far but I do believe it helps your mind work subconsciously on solving how to accomplish the goal. Make the goal specific but not unrealistic. Maybe it will be a 100 point gain in your FICO score. Maybe it will be attaining a 650 credit score which would be acceptable to most lenders for a home loan. The national median FICO credit score was 720 in 2014. 2) Evaluate Your Situation … Honestly. You have to know where you are starting from to know where to set your goal. You can obtain your credit score for free from CreditKarma.com. You get your score for free but you have to pay for your actual credit report. You can get your credit report free at AnnualCreditReport.com but you cannot get your credit score. Find out what your score is. Here are some general rules to think about depending on your score. Rule 1: Credit Repair Does Not Work If You Have Unpaid Obligations. Your score is an active math calculation even if it is not changing. This means that each month your credit score is recalculated based on past and recent reporting. Credit repair does not stop reporting. Credit repair sattempts to force the reporting bureaus to make favorable adjustments to the reporting to help improve your score. If next month the account’s owner reports negatively again then your score is going to go down once again. Credit repair only has a chance of success if all negative reporting is stopped…. permanently. Rule 2: If Your Score Is Too Low Or Your Unpaid Obligations Too High To Pay, Bankruptcy Is The Best Solution To Improve Your Credit. Getting your credit score to where you want when you still owe debt means you have to also figure out how to pay off the obligation to stop the negative reporting or other collection activities. My general rule is this: If your credit score is lower than 550 and the amount you owe is delinquent and over $10,000, bankruptcy is a faster, easier, and cheaper way to reach a higher credit score goal. You can recover your credit to the point of buying a house in about three years after a bankruptcy. Without a bankruptcy you could be still paying in three years and still have poor credit. Rule 3: Bankruptcy Is An Effective, Affordable, And Acceptable Method To Reach Your Credit Goal. Don’t be deceived by the misinformation about bankruptcy perpetuated by your misinformed co-workers, family, and friends. Fact 1: You can buy a house after bankruptcy. How fast you can buy a house will depend on how effective you follow our post-bankruptcy credit recovery plan. Fact 2: Your credit score begins improving immediately and you can apply for new credit immediately. The best mental picture I can give you about how bankruptcy works is that it is like cutting the anchor chain on your credit score so it can begin to float upward again. Fact 3: You can’t lose your job or security clearance because you filed bankruptcy. Bankruptcy is a federal right that even the federal government and military branches acknowledge. Fact 4: You will not lose your property if you seek experience legal counsel. Using the experienced, award-winning bankruptcy attorneys of the Merna Law Group insures you will keep your protected property. Habit 1: Set recurring electronic reminders on your calendar or phone about bill due dates. Habit 2: Sign up for text or email reminders of payments due with any company that offers it. Habit 3: Where possible, consider setting up automatic payments on recurring bills where the payment is always the same such as a house or auto loan. Staying on top of your regular monthly obligation may not help your score tremendously until you deal with the unpaid obligation but it will minimize damage and position you for great improvements in your credit score one you have eliminated any unpaid debt or regular negative reporting. 4) Set Up & Stick To A Budget. A budget is the cornerstone of any plan to get ahead financially. It is also the cornerstone for managing your credit score to a higher level by assisting you to pay your obligation on time. It helps you make better financial decision when entertaining taking out new credit. A budget will also help you create a plan for paying off any outstanding debt so you can become debt free. 5) Read #1 And Your Credit Goals Again and Again and Again and Tell Yourself You Believe You Can Accomplish it. I can’t stress enough that setting a specific goal and writing it down in plain sight will be the greatest help of all these steps. I want to add to it that you have to tell yourself you believe you can accomplish it also. Close your eyes and say it over and over in your head until you feel yourself accepting it as truth. Start today. If you need more information on how to improve your credit via bankruptcy give us a call at 800-662-8813. Merna Law wants to see you succeed. The Merna Law Group also assists clients living in Norfolk, Portsmouth, Suffolk, Chesapeake, Yorktown, Williamsburg, Chesterfield, Richmond, Newport News & Virginia Beach.